Big B took to Twitter to share the pictures from his family album and it was enough to excite the fans who seemed to love the way the Bachchan family dressed up. Bollywood 'Shahenshah' Amitabh Bachchan along with his family Jaya Bachchan, Abhishek Bachchan, Aishwarya Rai Bachchan attended a wedding function in Mumbai. 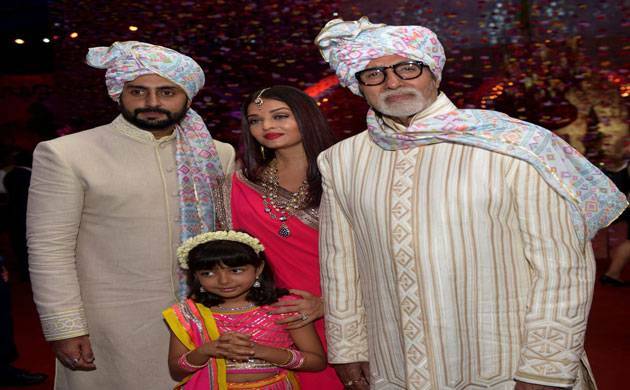 It is indeed a treat for the fans when all the members of the Bachchan family come together for a function. Both Amitabh and Abhishek looked classy in their traditional avatar wearing a stylish sherwani and a turban. Shweta who also attended the function was royally dressed in Abu Jani and Sandeep Khosla’s designer. Aishwarya and her little princess Aaradhya stole the limelight with their matching magenta traditional attire. The 'Devdas' actress carried her pink saree with complete grace and the maang teeka added to her beauty. Aaradhya looked damn cute in a pink and yellow lehenga and it was her hairstyle with a band of gajra which won the hearts of Twitterati. You can check out the candid moments from the wedding functions right here.